Find a Surfing trip that explores Far East. There are 10 tours to choose from, that range in length from 3 days up to 26 days. The most popular month for these tours is July, which has the most tour departures. 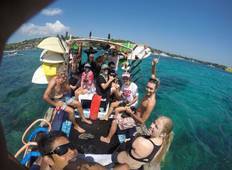 "It has been an amazing 6 days surf camp with Mojo Surf! So must fun, good people..."
"I had an amazing week. I never surfed before, but the teachers were great! I learned..."